Grace Food Processing & Packaging Machinery have carved a niche amongst the most dominant names in this domain, engaged in offering Rice Packaging Machines. These machines we provided are highly praised in the market for its rugged construction, optimum performance and simple operations. 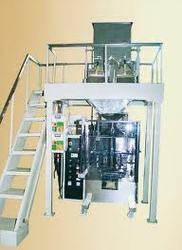 We design and manufacture comprehensive range of rice packaging machine that comes under the broad category of flow wrap machines. Fully Automatic Vertical Form Fill & Seal Machine is suitable to pack free flow granules like Tea, Rice, Sugar, Pulses, Grains, Granules, Pesticides & Fertilizer Granules etc. Electric Control By PLC & touch screen HMI. Compressed air required 6 kg. /sq.cm. Grace Food Processing & Packaging Industries, India's Leading Manufacturerer and Exporter Company in Food Snacks Processing Line, Snacks Extrusion System, Continous Frying System, Seasoning and Coating Machines, Automatic Weighing & Packaging Machines, Conveyor System. Our product assortment comprises of Food Processing Equipment, Snack Making Machine and Snack Making Equipment, which are massively appreciated and welcomed in the market for their consistent performance, low power consumption, longer functional, ease of operation, rugged construction, minimal maintenance, functional fluency and huge production rate. For the manufacturing process, we make use of fine quality raw material that is procured from our reliable and dependable vendors. Furthermore, it is ensured that all the set industry standards are followed. We strive to bring forth revolutionary technology in our product range, which includes highly productive Automatic Vertical Packaging Machines, Automatic Weighing System for Snacks Food Packaging Machines. Potato Chips Packing Machines and Puff Snacks Food Extruder, Popcorn Processing Line, Tortilla Chips Processing Line, Namkeen Snacks Making Line, Pasta Making Machines, Automatic Snacks Seasoning & Coating System, Peanut and Corn Nut Frying Line. The end goal of leadership stature makes us accountable to develop robust quality machinery featuring unsurpassed levels of productivity and comprehensive benefits of innovative design, power saving performance, user friendly operation, ease of installation and minimal maintenance requirements. Our professionals are backed with vast industrial knowledge and spare no effort to maintain an intellectual product portfolio that garners the long unmet requirements of our clients from food processing and packaging industry. Further, to become the most preferred entity, our R&D professionals put efforts to present customized solutions that enable us to meet and exceed the specifications of both large and midsized enterprises. In addition to this, we strive to be confident with our product quality hence we conduct rigorous market analysis and procure the best suited inventory of raw materials from recognized vendor base.